Tonight we ate out and forgot the camera, so here’s dessert! 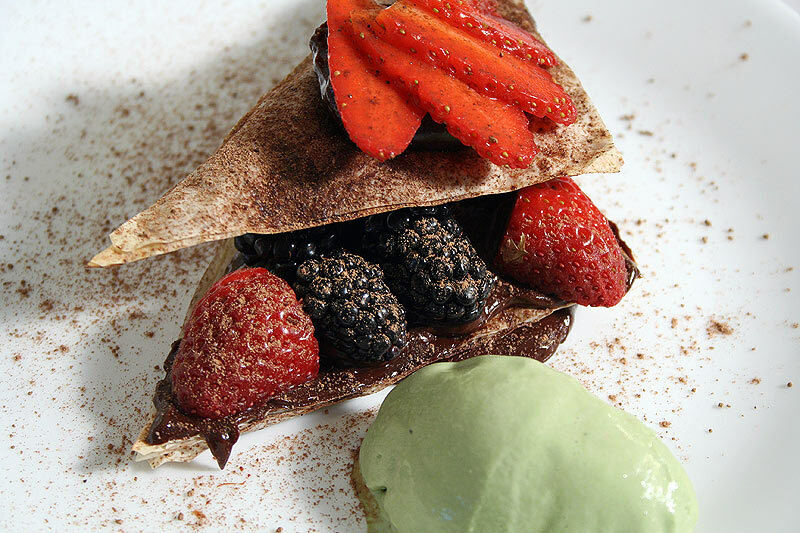 Dessert consisted of ganache, layered with cocoa filo, blackberries, and strawberries. A refreshing scoop of green tea ice cream was served on the side. A: I was very disappointed for a moment when we left to go to dinner and I realized we didn’t have the camera with us. Fortunately, the idea of blogging dessert came along. T: Yeah, we haven’t posted a dessert in a long time, so that’s cool. A: I know this statement will be sac-relig for a lot of people but… I’m not desserts biggest fan. A: you are a very kind person, T. Others may not be so forgiving…It’s not that I DISLIKE dessert. It’s just that I feel like I could be taking in those calories in better ways…like with lamb, or potatoes, or… anything salty. T: right, well, that’s what supper’s for. After supper, those of us who are sane enjoy a venture into sweets. it’s ok, nobody’s perfect. A: heheheh.. I AM sane. Some of us are not lean men with fast metabolisms who can eat both a rich dinner and dessert. so.. i opt for the rich dinner. A: or NOT. Maybe that’s what you’ll get for your b-day this year. you’ll just have to be good and find out. All this damned food blogging and looking at gorgeous pictures of dessert on flickr really has me wanting a moist, delightful, beautiful, gourmet cake of some sort. I’ve seen one from a place in san diego (which is where we live) that i’m DYING to try. T: What place is that? A: I think it’s called extraordinary desserts… i’m not completely sure though. A: For sure. So… what’d ya think of the dessert tonight? T: It was great. Tasty fruit, ganache… filo’s always good… and I love that green tea ice cream. I give it a 4/5. A: why thank you mista tylah. I surely do like my bread puddin’ too! it is actually one of the better things I make. T: yeah, well, that simply must change. how tired are you right now? 😉 just kidding, it can wait till tomorrow morning first thing. A: heheheh yeah, right. maybe next week. A: hmmm… you keep that poutting up and maybe it will be two weeks!……Psych! T: woah, i’m way too unstable for that kind of emotional toying! A: alright, alright, i’ll agree to possibly making it some time over the next week. Possibly. T: hee hee hee alright! !